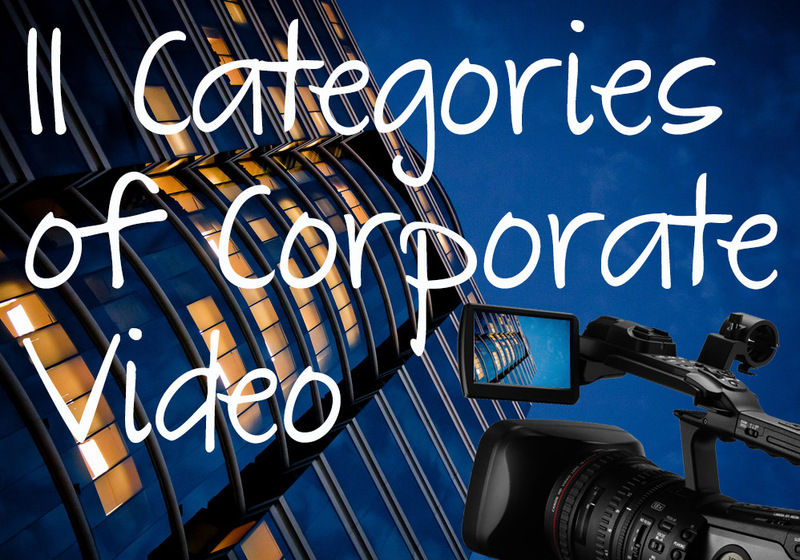 There is no definitive list of different kinds of corporate videos that you can create. This list is constantly evolving and changing, but these are the kinds of external-facing, corporate videos that I see most commonly. These kind of videos are the ones you’ll find on YouTube associated with a company or brand. Video can also be used as a very effective internal communication tool but those videos are more typically found inside a company’s firewall rather than out in the public view on YouTube. All these types of videos in this list are the kind a company sees fit to release for public consumption. One thing to remember is that you may create any of these kinds of videos with a specific purpose in mind, but your audience may use it for something entirely different. For example, I’ve created many, tightly-edited, feature demonstration videos that were intended show new and existing customers, features in a new release that they might be interested in. I’ve found sales guys using those videos instead of a demonstration, to save time, or to show a feature not yet available on their demo environment. Expect and encourage this. Once you put a video out on YouTube it may have it’s own life that is very different than the one you intended. I have seen managers panic about this and try to shut this ‘abuse’ down by taking videos off line. This over-reaction is to be discouraged. I also see people confusing types of videos with styles of video so I have tried to list both separately. Animation, for example, is not a type of video but a style. The animation style is better suited to certain types of videos (explainer and overview videos) than others (I haven’t seen animation used in customer testimonials before) but it is best to separate the two. When you are tasked to create a type of video, you should then look for the style that is best suited to that: working the other way around is putting the cart before the horse. You can also use a combination of styles, with elements of screencast, animation and live action often all blended together in overview videos with high production values as a common example. Read more about styles of video in the second part of this piece. An explainer video can introduce a company, product, or concept. Typically it is short (less than 2 minutes). The best explainer videos “show, don’t tell“, like this great example about new features in an iPad Drawing app. This Desk.com overview video is more typical with voice over, live action, animation and screencast elements combined to give you a minute and a half briefing on the product that makes you want to know more. (VNR: Video News Release & EPK: Electronic Press Kits) companies release many press releases every week but very few of them are released in video format. If you really want the press to deliver your message we have to understand that most ‘journalists’, and their readers, are lazy. Journalists don’t want to write and readers would rather watch or listen. If the press release was in a format publications could incorporate into their publications, sites or shows with little effort, the press releases will reach a larger audience – what’s the point of a press release no one in the press uses? This category could include video delivery of quarterly and annual reports. These should be short, like explainer videos, but are specifically about a new service or feature that your company offers. eg: CRM: Customer 360.
executives speak to customers, people at events talk about a show, etc. Hardly any executives are doing this yet, but more should, especially in a culture where the cult of personality is king (assuming the executive has a personality). They invest time getting their staff to send out content to email lists, both inside and outside the company. More should supplement, or replace those, with a simple, direct to webcam piece. It would connect with their organization and their customers so much more effectively. really hard to get your customers to participate in to begin with depending upon your brand but is promoted as the way of the future. This is easy for a company like GoPro but not so much for an enterprise software company. Get people to work for your company: more important as competition for graduates heats up especially in Silicon Valley and New York. eg: At Twitter, The Future is You! You could argue that this should be part of the Our Company is Cool section. 8 – Event sessions, performance, lectures, highlights and event trailers. The number of people you can reach with a presentation you worked your but off on is limited to the number of people who turn up, on the day, in the room. The potential audience on YouTube is almost infinite. Get the full potential out of all that preparation work you and others put into your presentation and PPT deck. If the session isn’t on a main stage, and recorded live and published after the fact, think about recording the presentation as soon as you get back in the office after the conference. The more intimate presentation to camera might work better than you pacing back and forth on a conference room stage anyway. This has everything to do with maximizing the return on any investment you make in preparing a presentation. Every time a PowerPoint deck is presented for one time only to an in-person audience you are missing an opportunity to reach many more people. These kind of shows, if produced in-house, can require a professional style TV studio, although there is room for a more grass-roots approach like that proposed by Jefferson Graham in his book Video Nation, and executed by him on his USA Today show, Talking Tech. This category can contain newsletter style content like this excellent example from Salesforce. These may run on the web, on screens at conferences, or even on TV. If your company has a central video group, this is their purview and even they will probably contract this out to and outside agency. In the rest of the world there has been a move, in part, towards more grass roots advertising but this is more aimed a consumer based products. Company culture: volunteers (eg: Salesforce: What will it take to change this planet we all share? ), charity, green programs, corporate giving, etc. How it’s made: development in developers own words. Oracle’s company story. Entertainment and sponsored videos: sports sponsorship, extreme sports, etc.